For awhile Joe and I allowed him to take the iPad up to bed at night and watch his stuff until a certain time. Soon, as you can imagine, he was waking up tired and cranky. We also feared he’d go blind and realized he may watch inappropriate stuff. When we cut off the nighttime iPad watching, JC was not happy. His iPad obsession turned into a nightly battle. Me: You can’t bring the iPad to bed. JC: Why not? What did I do? Me: Nothing. It’s not a punishment. It’s just not good for your eyes. JC: But I’ll dim it. Etcetera, etcetera. Every night. The same conversation. Well, a few nights ago, JC flat out refused to give up the iPad at bedtime. As he and I marched up the stairs towards his room, he held it to his chest. We had The Conversation. I told him he had to listen to his mother. I tried the ol’ “Jesus is watching you” and when that didn’t work, I gave a shout out for Eugene the Elf to take note. I threatened to “get Dad involved.” When neither Jesus nor Eugene nor Dad managed to convince him to hand over the goods, I tried to pry it from his little hands. That didn’t work either. The kid is strong. Me: GIVE ME THE iPAD or YOU’LL NEVER SEE IT AGAIN. JC: I’M NOT GOING TO LISTEN TO YOU. Me: YOU HAVE TO LISTEN TO ME. IT’S LATE AND YOU HAVE TO GO TO SLEEP. AND YOU’LL GO BLIND! JC: BUT I DIDN’T DO ANYTHING! WHY ARE YOU PUNISHING ME? (JC pauses while I sigh) Who was that lady on the bus? Huh? I thought. Is this kid nuts? I should have known I was being set up. JC: No. The lady who had to sit in the back of the bus. JC: Yeah! ROSA PARKS! She didn’t listen when they told her to sit on the back of the bus, and she’s an AMERICAN HERO. So I’m not going to listen to YOU. Me: (Stares at kid, dumbfounded). For about three seconds while I stood there staring at a proudly defiant JC clutching the iPad to his chest, I thought about laughing, then maybe crying, then begging Calgon to “take me away.” I attempted to formulate an argument in my head about how the Civil Rights Movement is a bit different from a ten-year-old bringing an iPad to bed at night. We stared each other down. I can do this, I thought. 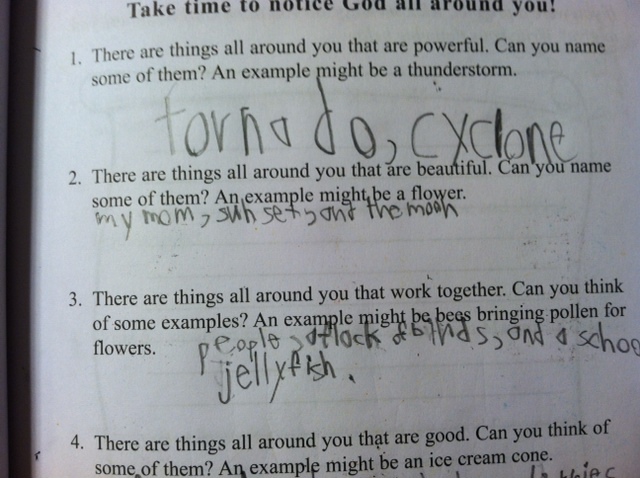 I can beat this kid. But it was late. I was tired and worn out from the day. I didn’t have the fight in me (Ms. Parks would have been disappointed). I squinted at JC and shook my head. Rosa Parks? Really? “Just take the iPad,” I said as Evil JC grinned. “Go,” I demanded. He scurried up the stairs leaving me in his dust. A few years back on Halloween, JC dressed as a character from Harry Potter. His favorite part of the costume was the wand. On his candy-induced sugar high, JC got a bit excited and started knocking people with his wand. When he hit me with it, his father, rightly so, freaked out and sent him to bed. JC cried and shouted and real tears poured from his eyes as he stomped up to his room. Joe followed him and gave him a talk about respecting his mother on the way up the stairs. My parents and I stayed downstairs feeling a little bad that JC was being punished on a holiday, but agreed he was out of control. We heard JC and Dad arguing upstairs and JC’s door slamming repeatedly. Finally, we heard Joe coming down the stairs. Ut-oh, we thought, figuring Joe was going to be steaming mad. Instead, Joe comes down the stairs laughing. 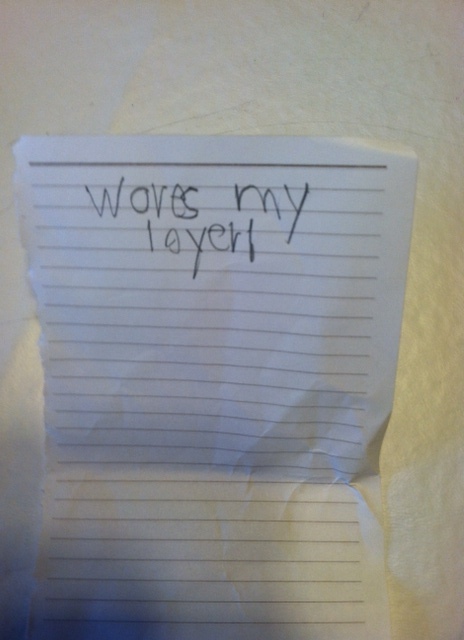 The note read: “Wores my loyer!” (Translation: “Where’s my lawyer!”). Really? He was 8! Thank God he didn’t know how to use the phone or he probably would have called the Public Defender’s Office. We couldn’t help but laugh. 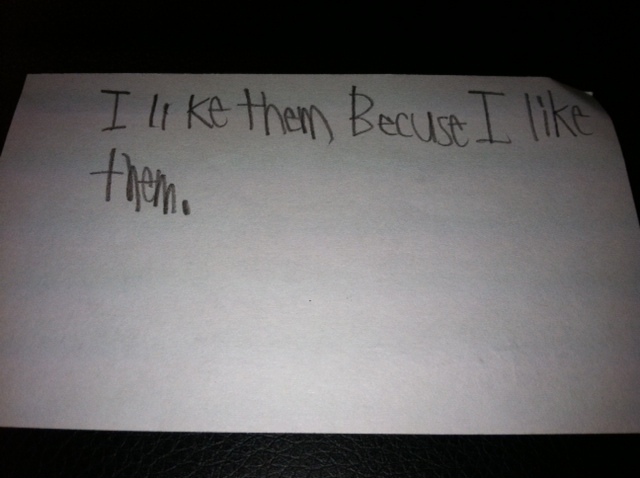 “I like them because I like them.” So there! This kid! I don’t know what to do with him. Despite his defiance, he’s super sweet (he said I was beautiful and compared me to a sunset and the moon, Blogtropolis!). Smart, sweet, and defiant may be a lethal combination. Did I mention he’s handsome too? Who knows what he can accomplish with that mix. It starts with winning the iPad Challenge. What’s next? Only time will tell. I’ll keep you updated on the Adventures of JC. Have a nice night! Let him keep the ipad…take the charger. This is the best way to deal with the ipad situation. Lol. Ha ha! Excellent read! I hope next time he doesn’t have his Lawyer with him! Sheesh! lol! We do the same for my son…we take the charger instead of the actual phone or I-pad. He is resourceful though and will dig up some old system to get back on the internet. 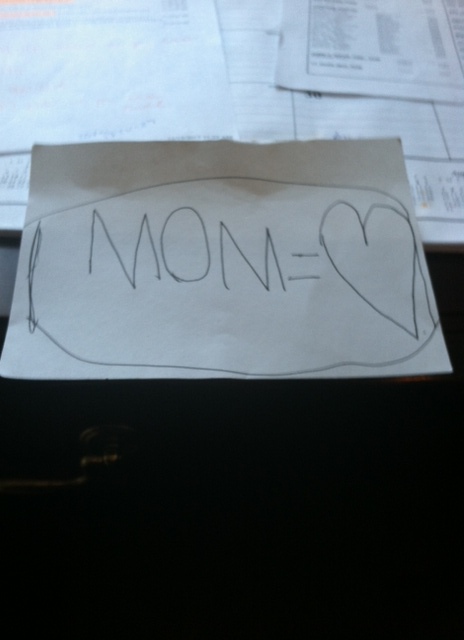 As for the notes…they are hilarious! 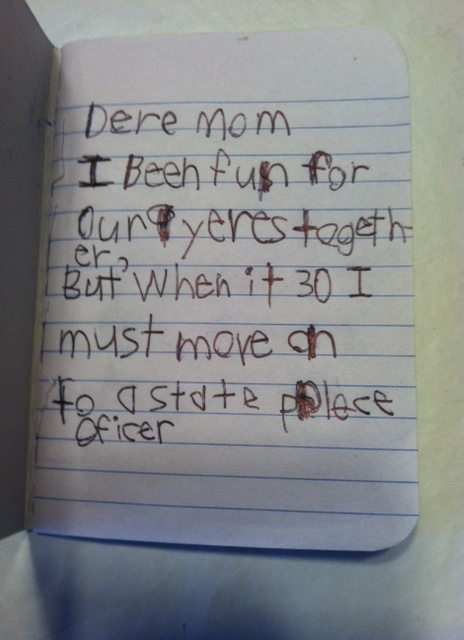 I have kept a few things my son wrote and some of his awful pictures. They will work great in the future when I need to embarrass him! Your boy is adorable!! And such a bright and sweet little kid. It must be such a joy (on most days) to have him. I can’t wait til I have my own kids. I hope they’ll just be as bright, rebellious and sweet as yours! He likes u a lot!! why dooes he wants to be police officer? You’ll have to practice you’re jaw-dropping reaction ’cause, as an adult, he’s going to amaze you even more. You take credit for some of his good stuff, too? You should. The stubborn stuff is someone else’s fault, I’m sure. Best. Of. Luck. I suggest lots and lots of summer camps and after school programs for REALLY SMART KIDS. (Hey ~ my mom once said to me, “God chooses our kids for us.” So when God looked at you he knew you would be the perfect fit for JC. oh little smart boys and their sweet defiance- its part of the package of loving them! Happy holidays and have a great year ahead. My son is 3 and I fight with him over this ipad thing, he could stay seated for hours watching very educative cartoon on the ipad. There is just something about technology that these kids just love. Or maybe it comes with the age. They are all blessed. I remember I was like that when I was growing up with a meager Sega Genesis. I think as children we don’t quite get that our toys (if you will) will still be there when we wake up tomorrow. Very sweet post. Pick your battles carefully — you won’t win them all! I am past this stage in my life…. but I would turn the clock back in a nano-second. Enjoy him… the days seem long, but years fly by. Thank you Connie! I try to enjoy, I really do. Some days enjoying is a challenge. But I know you’re right. The time will fly. I can’t believe he’s 10 already.